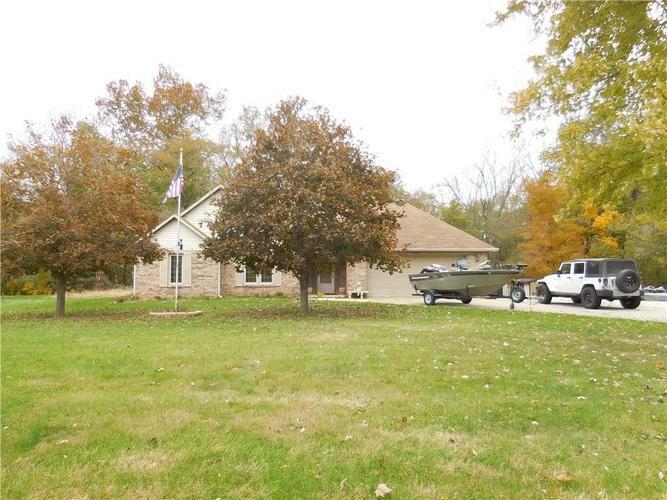 Custom brick ranch on sitting on a parklike setting which is nearly 2 acres. Watch the deer and wildlife from your gorgeous sunroom or patio area. Sunroom is surrounded by natural light and features new clay wood look tile. Loads of countertop and cabinets in the kitchen but offers a pantry if you need more space. All appliances remain. Separate laundry room off of the kitchen. Family room offers tray ceiling and a gas log fireplace. 3 bedrooms down and 2 full baths. Upstairs has a large bonus room that could be used as a 4th bedroom. Has a huge walk in closet. Floored storage space above garage. Lots of insulation. New water heater, water softener and iron filter. Garage has a half bath. Only selling due to relocation. MOTIVATED TO SELL! Directions:US 40 E to Knightstown to Jefferson St. South on Jefferson which will turn into 140.Turn West to home. Home is on the right side of the road. Home is hidden behind Blue Spruces ONE YEAR WARRANTY INCLUDED! Listing provided courtesy of Home Loop Realty, LLC.